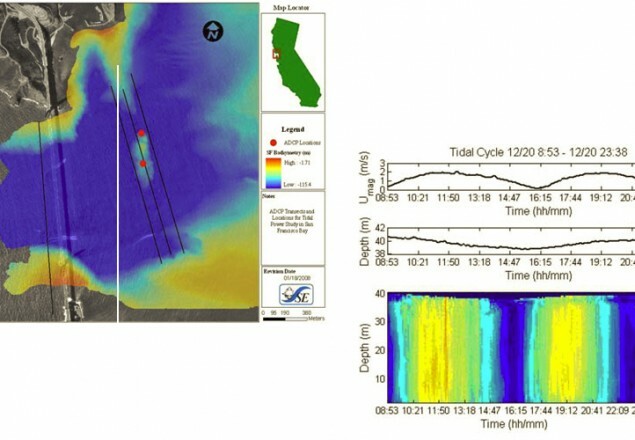 Golden Gate Tidal Power Generation Study | Sea Engineering, Inc.
Sea Engineering, Inc. deployed two bottom-mounted (upward-looking) Acoustic Doppler Current Profilers (ADCPs) in proximity to the Golden Gate entrance of San Francisco Bay, California, USA. The objective was to collect current data to validate modeling efforts for a tidal power generation study. The ADCPs were deployed at 40 meter depth and 60 meter depth for a period of one month, to measure current velocity data in the water column that encompassed the monthly range of tidal currents. The instruments were mounted inside submerged buoys that were anchored to the seafloor. This deployment scheme ensured the ADCPs remained nearly vertical and eliminated the potential of deploying a tripod on an uneven seafloor. In addition, cross-channel transects were navigated with a vessel-mounted (down-ward looking) ADCP during the spring tidal cycles. The objective was to measure the cross-channel current dynamics for the largest expected currents. Four transects were navigated: One was immediately west of the Golden Gate Bridge, measuring current dynamics within the narrowest portion of the gate; Three were east of the bridge, in close proximity to a raised submarine sill. The three transects measured current velocity changes that might be caused by the existence of the sill (e.g. speed increases around the perimeter due to funneling).